CHICAGO – In the latest HollywoodChicago.com Hookup: DVD with our unique social giveaway technology, we have 5 pairs of advance-screening movie tickets up for grabs for “The Last Stand” starring Arnold Schwarzenegger! Plus, our winners will each win an action DVD set with “Total Recall,” “The Expendables” and “Crank” DVDs! “The Last Stand,” which hits theatres on Jan. 18, 2013 and is rated “R,” also stars Forest Whitaker, Johnny Knoxville, Luis Guzmán, Eduardo Noriega, Arron Shiver, Titos Menchaca, Richard Dillard, Sonny Landham, Mathew Greer, Peter Stormare, Chris Browning, Christiana Leucas, Zach Gilford, Rio Alexander, James Burnett and David Midthunder from director Jee-woon Kim and writers Andrew Knauer and Jeffrey Nachmanoff. Note: You must be 17+ to attend this “R”-rated screening. This advance movie screening for “The Last Stand” is on Wednesday, Jan. 16, 2013 at 7 p.m. in downtown Chicago. To win your free “The Last Stand” passes and action DVD set courtesy of HollywoodChicago.com, just get interactive with our unique Hookup technology directly below. That’s it! The more social actions you complete below, the higher yours odds of winning! Note: You must enter your mailing address to win. Action icon Arnold Schwarzenegger makes his much-anticipated return to the big screen in Korean director Jee-woon Kim’s hard-hitting U.S. directorial debut “The Last Stand”. After leaving his LAPD narcotics post following a bungled operation that left him wracked with remorse and regret, Sheriff Ray Owens (Schwarzenegger) moved out of Los Angeles and settled into a life fighting what little crime takes place in sleepy border town Sommerton Junction. But that peaceful existence is shattered when Gabriel Cortez (Eduardo Noriega) – the most notorious, wanted drug kingpin in the western hemisphere – makes a deadly yet spectacular escape from an FBI prisoner convoy. With the help of a fierce band of lawless mercenaries led by the icy Burrell (Peter Stormare), Cortez begins racing toward the U.S./Mexico border at 250 miles per hour in a specially outfitted Corvette ZR1 with a hostage in tow. Cortez’ path: straight through Summerton Junction where the whole of the U.S. law enforcement – including Agent John Bannister (Forest Whitaker) – will have their final opportunity to intercept him before the violent fugitive slips across the border forever. At first reluctant to become involved and then counted out because of the perceived ineptitude of his small-town force, Owens ultimately rallies his team and takes the matter into his own hands. This sets the stage for a classic showdown. 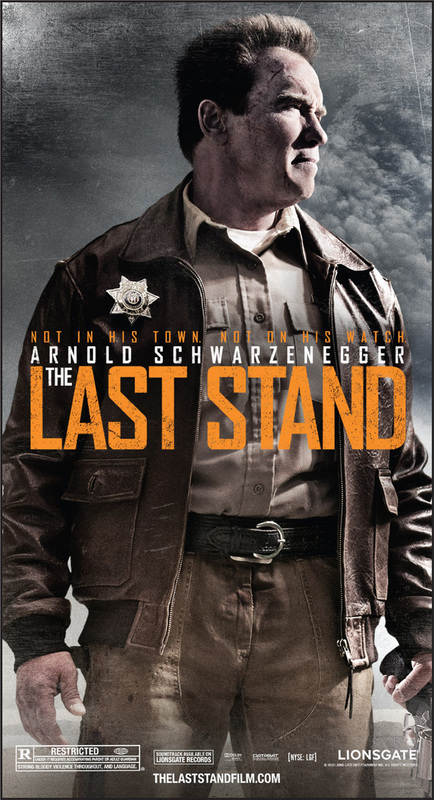 The movie poster for “The Last Stand” starring Arnold Schwarzenegger. The movie trailer for “The Last Stand” can be watched now below. Note: This is a red-band trailer intended for mature audiences only. This HollywoodChicago.com Hookup is simple! Just get interactive in our unique Hookup technology above. We will award 5 free action DVD sets and advance-screening movie tickets to “The Last Stand” based on social entry numbers and/or randomly. Good luck!